Protein powder has gone primal with a new crop of bone-heavy protein powders. Bone broth protein powders, made from dehydrated bone broth, promise a hefty dose of protein, collagen, vitamins and minerals in every serving. What&apos;s the best bone broth protein for your buck? 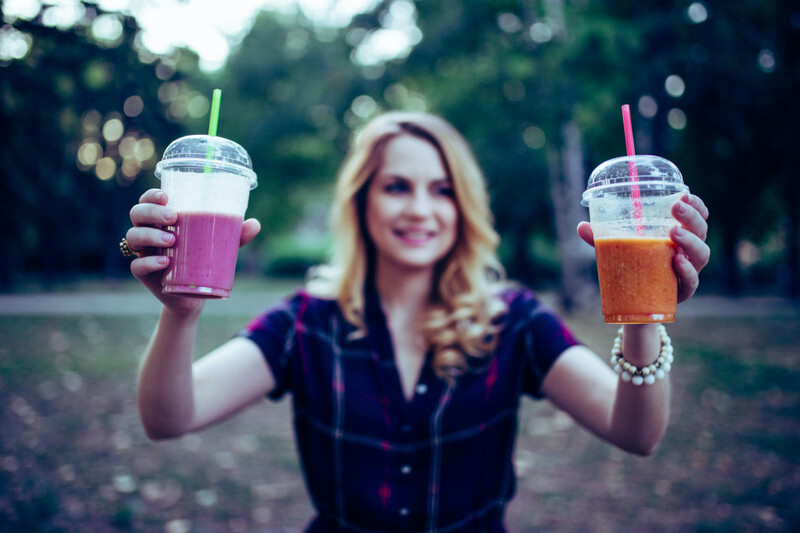 Learn all the benefits of bone broth protein, and how to find the best bone broth protein brands, as not all bone broth proteins are created equally. Bone broth protein is made the same way bone broth is made. Chicken or beef bones, ligaments, tendons, and cartilage are cooked under sustained high heat with water. Ryan Raman, MS, RD of Healthline notes that manufacturers use high heat pressure-cooking in order to for broth to be cooked for a shorter time, but still retain beneficial nutrients. 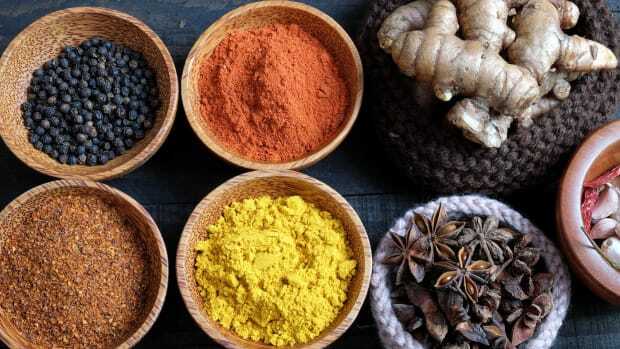 These nutrients include chondroitin, glucosamine, hyaluronic acid, potassium, calcium, and magnesium, all of which can be lost during long periods of cooking, Raman notes. After the bone broth is cooked, the bones are removed and discarded. The liquid is then dehydrated to form a concentrated bone broth powder. Additional ingredients may be added such as natural flavors and sweeteners. The result is a protein-rich bone broth protein powder packed with beneficial nutrients, healthy fats, and amino acids. Like bone broth, bone broth protein powder has numerous health benefits. Bone broth contains 19 essential and nonessential amino acids, which are essential for creating protein in the body. 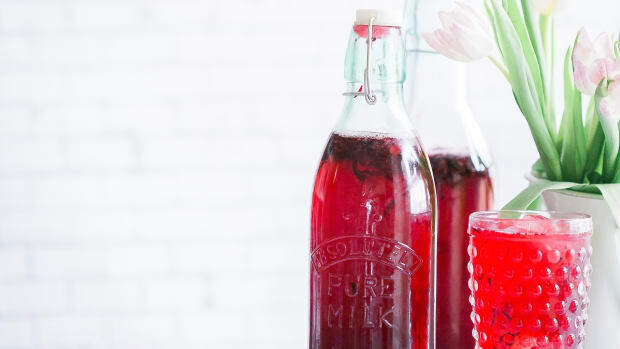 It’s also rich in collagen and gelatin, which form connective tissues and promote joint health, and a variety of electrolytes and minerals. 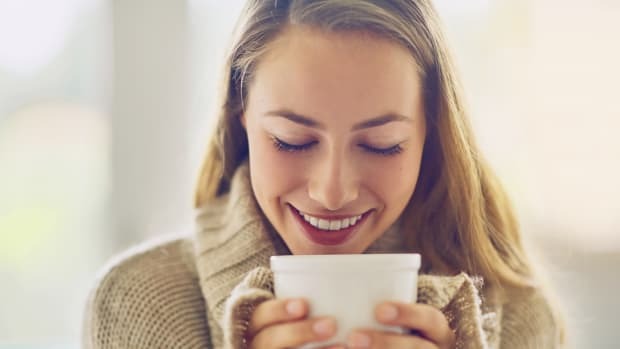 Bone broth contains calcium, magnesium, potassium, and phosphorus, all of which are essential for bone health, nerve functioning, and digestive function. Bone broth protein powder is a gut-friendly and gut-healing food. In fact, bone broth protein powder is easier to digest than many other protein powders, such as whey, which contains dairy proteins that can provoke allergic response. 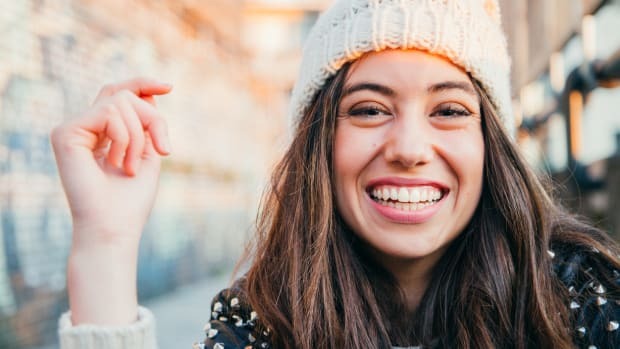 Gelatin, found in bone broth protein, supports intestinal health and is beneficial for restoring integrity to the gut, according to a 2012 study published in Clinical and Experimental Gastroenterology. The skin benefits from bone broth and bone broth protein powder, too. 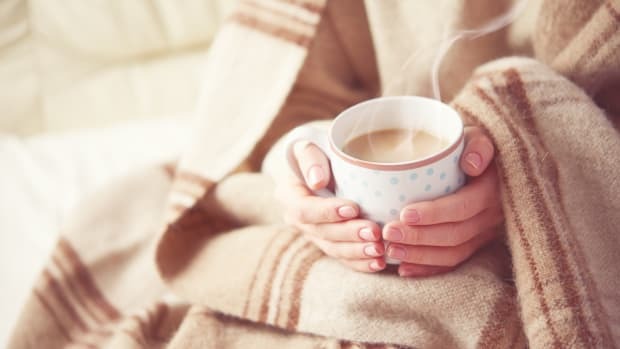 Numerous studies have shown the collagen and amino acids in bone broth to provide moisture to dry skin, reduce fine lines and wrinkles, and improve hallmarks of skin aging. Bone broth consumption is also associated with healthy immune system function and increasing antioxidant defense systems. There are a variety of bone broth protein powders and bone broths on the market. Always choose a brand that contains minimal ingredients, and one that is non-GMO and organic, if possible. These three brands and bone broth protein powders have been tried and true, and are all uniquely delicious. Try adding one into your diet for a protein boost, daily. 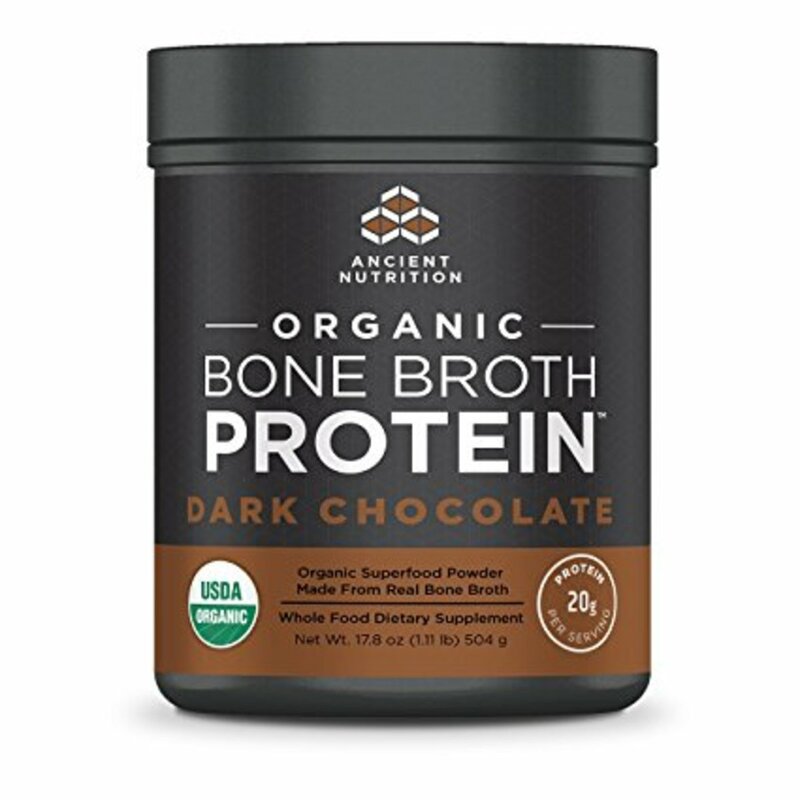 This bone broth protein powder from Ancient Nutrition is deliciously chocolaty. Co-founded by Dr. Josh Axe, D.N.M., C.N.S., D.C., founder of DrAxe.com, best-selling author of "Eat Dirt," Ancient Nutrition bone broth protein is non-GMO, paleo-friendly, and produced without grains, dairy, nuts, and soy. It’s also rigorously tested for contaminants, heavy metals, and environmental chemicals to ensure high quality and USDA organic standards. 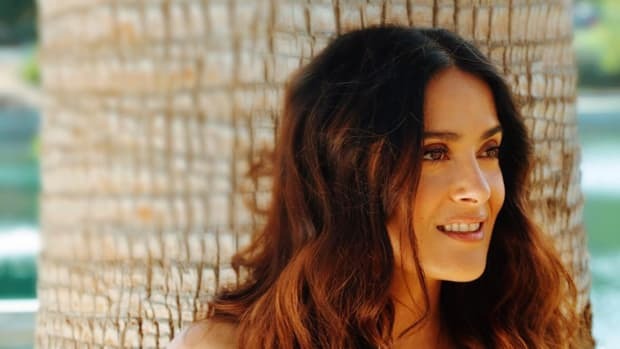 “It can be included in your favorite appetizers, breakfasts, lunches, dinners and yummy desserts,” Axe says. PSA: along with dark chocolate, Ancient Nutrition makes a variety of other bone broth protein powder flavors including coffee, greens, cinnamon apple, banana crème, and turmeric to make the dreamiest (and most collagen-packed) turmeric latte ever. Price point: $47.00 for 17.8 ounces, roughly 17 servings. Precision Natural’s bone broth protein powder is certified paleo-friendly, non-GMO, gluten-free, and sourced from grass-fed cows. According to Precision Naturals, bone broth protein powder provides a vast array of nutrients in an easily absorbable form. 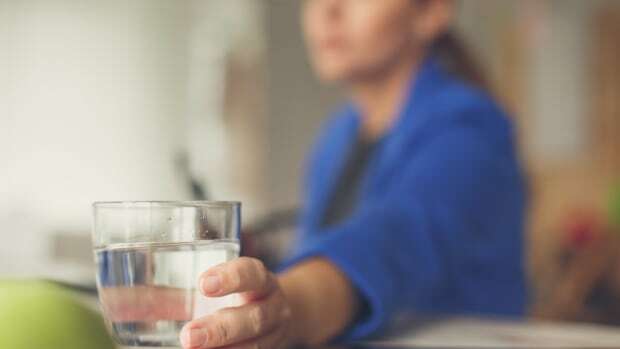 “These include calcium, phosphorus, silica, glucosamine, chondroitin sulfate, and many vital trace minerals, vitamins, and proteoglycans,” the company notes. 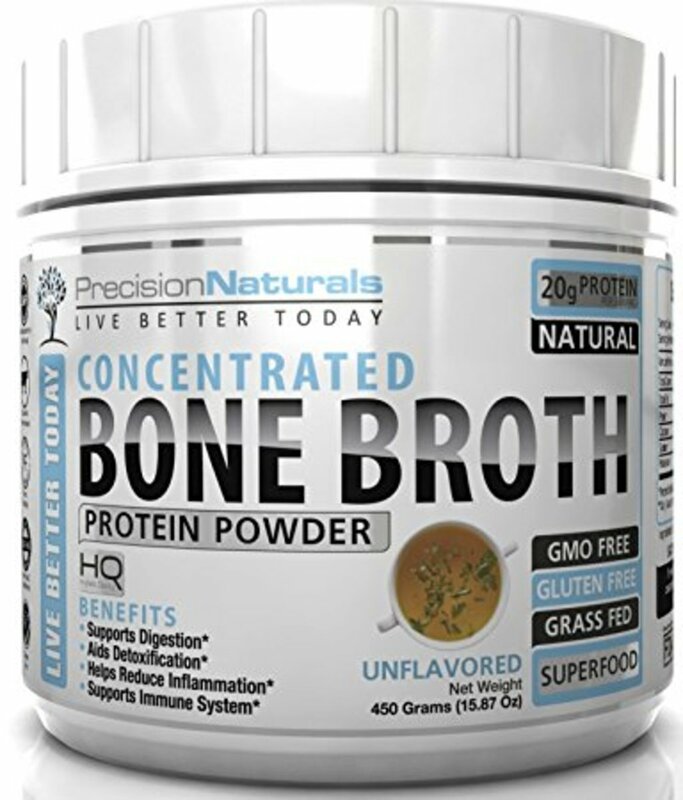 This unflavored and neutral tasting bone broth protein powder can be added to water for a collagen and protein-rich beverage, smoothies, soups, sauces, coffee, tea, and so much more. 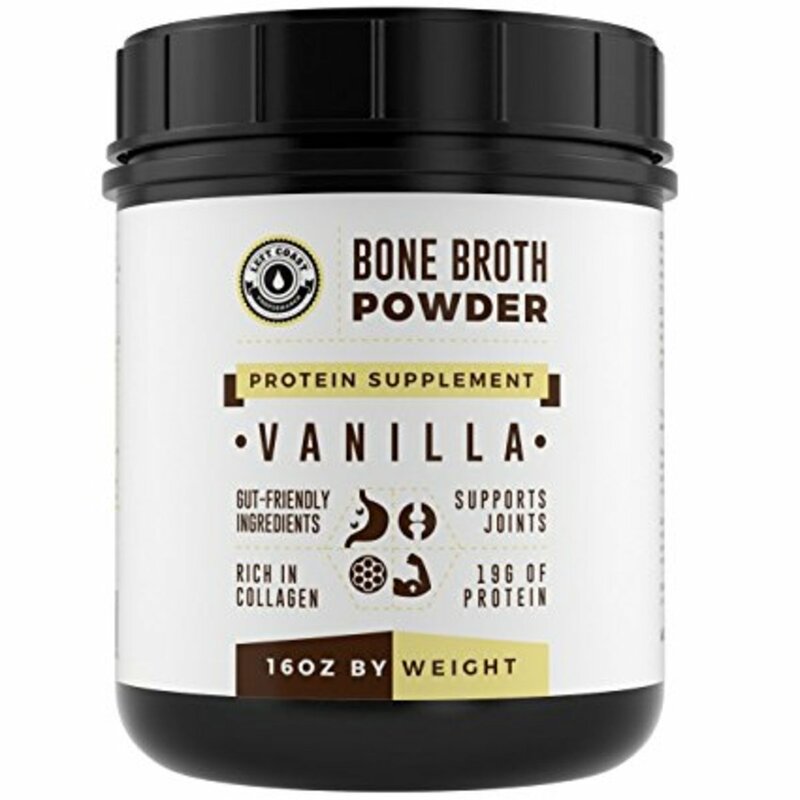 Packed with collagen, glucosamine, chondroitin and 18 grams of protein per serving, Left Coast Performance vanilla bone broth protein powder is perfect for a post-workout smoothie. It’s also made with minimal ingredients and is non-GMO, dairy-free, soy-free, gluten-free, and grain-free, and contains less than one gram of sugar per serving. Try making homemade almond milk with vanilla bone broth protein powder, or blending it into desserts and smoothies. Left Coast Performance’s bone broth protein powder also is made in a chocolate flavor for a delicious chocolaty treat.